ClockWay.com - The Large Clock Site! TOP NAMED BRANDS - OVER 30 BRANDS! OVER 5000 MODELS TO SELECT FROM! Testimonials & Reviews: Don't listen to us, listen to our customers! Thank you for your prompt delivery and for the quality of the clock. It is beautiful. When I had questions before ordering your customer service was excellent, and prompt in helping and answering my questions. I would defenately order from you again. I just received my Seiko music in motion clock today and it is just wonderful! It was pacakaged securely with no problems whatsoever and I just love hearing the beautiful music on each hour. 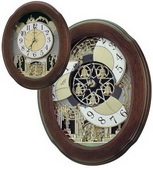 Shipping was fast and I will order again as this is the best site in which to order clocks. Customer service was great! I am a customer for life now!! Review: We ordered this clock as a gift which we needed with short notice. Clock Way came through. The clock itself is beautiful, but the delivery was amazing. We ordered online Friday night at 10pm and received the clock the following Tuesday! We will be very pleased to give this clock as a gift. We will always consider Clock Way in the future. I purchased the bird cuckoo clock and within a week had recieved it! Nicely packed and even cam with the mounting hardware! I am very impressed by the speed in which the item was sent and the care in packing! I will definitely order again! Thank you! This is my second order for the same item in two weeks. My original purchase was for my office but my husband loved my clock so much that he insisted on my getting another one for home. So - number two is for home! Your products are beautiful. So glad I found you on the internet. We ordered our clock late Sun. and were enjoying its delightful sound on Tuesday evening. Thank you for such prompt service. I was asked by my boss to come up with a wedding gift for one of our best customers son that was getting married. What a task, what do you get newlyweds that more than likely already have EVERYTHING? I have an antique Grandfather clock in my home and I love it, so I thought of a Grandfather clock, I picked out this one from your website and showed it to my boss and the Grooms Mother and she loved the idea so we went with it. I have been informed that this clock arrived the day before the Newlyweds were to return from their honeymoon and that it is absolutely beautiful. I have been praised for my wonderful idea buying this clock for the gift. Price was incredible and service was prompt and delivery smooth! They even worked with the Grooms Mother to coordinate the delivery to their new home! Just wanted to tell you how much I love my Seiko Beamont Chiming Wall Clock. It arrived within a reasonable amount of time, and I could tell it was shipped with a lot of care. It was easy to set and the Westiminster chimes are rich in sound. Thank you for your great service. The gentleman came yesterday to set up the clock. He gave absolutely superb service! My clock looks beautiful at the end of my hallway. I will recommend you to my friends. Thanks for you help. I wanted to write and tell you how much I've enjoyed the clock purchased back in July of last year. I mounted it in my great room over the TV and it really looks good there in addition to providing the time at just a glance. Great product!! People always ask where it came from because you sure can't get anything like it around here. We absolutely LOVE this cuckoo clock. brings back warm childhood memories. clock arrived in 5 days, carefully packaged with lots of instructions, and within 24 hours, we had it set up and working in a timely manner. our dogs haven't adjusted to it yet(they bark at it) but it makes us smile. Thank you so much!!! You have been a lovely company to work with. I will be ordering another globe soon. It took me two weeks searching the web to find the best price online for a cuckoo clock. I located your site on the first day and thirteen days later could not find a better site for price and you have the best guarantee. After having my clock for one week I could not be any happier. Your company and staff are so professional. The clock was well protected and arrived quickly. You kept me well inform of my order an it's shipping process. I will tell my family and friends how satisfied I am with Clock Way. I hope any that reads this review will as safe as I would to buy from you again. Hi, I cannot believe how fast the clock arrived. I am very impressed and free shipping too! I just have to say thanks so much! I have ordered several clocks that I love and I needed another clock for our master bathroom and I called and your sales person picked the most beautiful & perfect clock. I would not have thought of going in that direction. I am so impressed and just wanted to say thanks. I didn't get her name but she picked out a glass wall clock and then I ordered it online that very same morning. I love and appreciate the online system and the person service I received. I recieved my clock last night...My God!!!! How beautiful it is. I love my Clock. Worth the wait. I will defiantly purchase from your web site again My friends and family once they see the clock... they too will purchase for you guys. I just received my mirror and my new bathroom now looks like it came from a designer magazine. The shipping was very timely and the mirror was exactly as described and of high quality. I would order again. Thank you. This clock is so majestic! It will certainly make a bold statement in any room. Well-packaged and fast shipping. I couldn't be happier! Thank you, Clock Way. I just received my kitchen clock from your co. The design is elegant and colors are perfect. I was pleasantly surprised at how beautiful it is. I spent a lot of time looking for the perfect fit for a selected kitchen wall. I ordered one from another co and it arrived with poor packing, quality and was so loud that I took it back. It was even more expensive. Contrary to yours and I will absolutely recommned your co and will order again. Your website is well organized and your checkout screens are very good so that no one should get confused by ship versus bill info. CRICKET = AKA JANE M.
THANK YOU SO MUCH FOR KEEPING ME INFORMED ABOUT MY ORDER, PLEASE SEND ANY CATALOG YOU MAY HAVE. I AM VERY HAPPY WITH THIS SERVICE. Received shipment today. It was a pleasure doing business with you. The clock is very nice. Thank you for your fast and excellent service. I just love my new Cappuccino clock! Your customer service is very prompt in responding and very accommodating. It was a pleasure doing business with your company. Thank you, God bless and have a very Merry Christmas! I have been delighted with my new clock. The craftsmanship, warranty, and prices are so good that I will be purchasing several more for family members at Christmas. Thanks for a quality product. Thank you so much for your prompt service. You are my new clock "go-to". Have a wonderful Thanksgiving! Thanks for the fast delivery and the great prices. Wish more companies were like yours. Please let the appropriate staff know that I received my clock today and I love it. I appreciate the fast shipping and excellent packing too. Thanks for the good service and communication. I would like to thank you for your prompt response to our order. We received it yesterday and everything looks okay so far. It is a wedding present and won't be delivered for about 5 or 6 weeks. Thank you again. We have received our new German Hermie's Chiming Wall Clock in excellent condition. It has been running in a very acceptable manner for weeks. We are pleased with it. Thank you for your cooperation and assistance in obtaining it for us. It is a very handsome clock and we hope to enjoy it for years to come. Guys: I just hung up my mirrors. They are GORGEOUS! Well worth the wait. Thank you for all of your personal attention in this matter. Very pleased with product and shipping promptness. Thanks again! You all have a great customer service team. I just received my clock. Thank you very much for the prompt shipment. I am obligated to let you know that your salesperson "Mike" is not good but EXCELLENT. I am so grateful and impressed with your customer service. Thank you. This means your have a new and loyal customer who will go no farther in looking for clocks of any kind. And, tell others. I recently purchased your product, and am so pleased with it. It is beautiful and looks great in my living room. The service was exceptional and I received it within one week of ordering. I will so business with you again. Thank you for the good service, I will certainly use you for future purchases and pass along your excellent customer service and follow-up to the people I know that shop exclusively on the Net. Thanks again! Your service is a welcome surprise. Just wanted to let you know that the package arrived today in fine condition. Please accept my thanks for your outstanding customer service on this order. Our son & his family visited our home with three 3 grandchildren who were drawn to our old wall clock which struck the winsminster chimes during their short visit. We felt we wanted to send them all a gift of time. Found your fantastic web site & included a note along with our gift..(your site allows this!).. "THE TIMES OF TIME CONTINUE AS WE ARE APART" They called today and were so excited as all opened the huge box. each of the children had a part in preparing the clock to hang on their wall. Everyone was so pleased with the appearance...and outstanding reproduction of the sound. just two weeks ago my son actually heard BIG BEN live when he was in London on a business trip..!! ps..ordered another for our daughter& her family!! Thanks "Service Team" for your continued support, communication, and assisting me with the lost plate. My family loved it. Thanks again and hope to do business in the furture. What a wonderful company! I ordered a pocket watch for a great price and it arrived two days later! Excellent customer service. Will buy from again! Fast service..picture is accurate but seeing in person is better with the quality of materials. Keeps perfect time. Thank you for the great selection and wonderful service. I have already referred you. Order received. I enjoyed your great service. I'll use it again, and recommend it to others. Review: Am enjoying this clock very much. I love the sound of the chimes. Thank you for the rapid shipment also. Review: I love your site. Your selection is so good,and along with your great pricing,I find that I come back to buy something that I don't even need. I look through your selections,just to see if I can fit something in my house. This clock really looks nice in my kitchen. I just wanted to thank you all for making sure we received the clock that we purchased by today. . I received it today at 12:30 and had to be there by 2:30. They loved it and it looks beautiful. Thanks for your help in this matter. It really meant a lot to us. We look forward to buying from you all again in the future and recommending you to others. My clock came today and is beautiful. I received it on time and it was securely packed and in excellent condition. I definitly would make another purchase. Thank you so much. The clock we ordered was here in 3 days in perfect condition. Thanks for the prompt shipping and great price. You are a pleasure to do business with. My clock did come, it looks absolutely wonderful, and the price was amazingly great! Thank you again for an excellent product and great customer service. Great service. Delivered exactly when promised even though the midwest area was enduring flooding. Since I live in Portland, Oregon and it was shipped from New Jersey that was impressive! I would recommend this company to anyone wanting a good value clock and FREE shipping to boot!!!!! Review: I had to find a big wall clock for our animal clinic and this one fit the bill. It's adorable and big enough for our wall. It is even cuter in person and well made. I can see this hanging on our wall for years to come. Thank you very much. The clock arrived this morning as indicated, just in time for their anniversary. They were very happy with the beautiful gift and I was very pleased with your service. We recieved our Mantel Clock yesterday (03/30/09). It is so beautiful! We are very pleased with the product. The chimes are pleasant to the ears. I placed my order on Dec. 10, 2009 with high hopes of the item being delivered on time (due to the Christmas season). I am so excited to say that my order arrived on time on 12-18-09. I was very concerned, as this is the 1st time I have ever ordered on-line for a Christmas gift. THANK YOU SO MUCH! It really is appreciated! (and another little note---it was packaged so well!!!! THANKS AGAIN! Awesome Clock, thank you for the prompt and careful shipping ! I had been searching locally of an Electric wall clock & stumbled on your website by googling for clocks. I called, talked to a rep... She was super friendly, very helpful. Ordered my clock and got in it time for my gift to my husband for Fathers Day. Will reccommend you guys! Thank you for the excellent service that I received and the superb pocket watch that I purchased. Bought the 24" - but wish I had bought the 40" as it would have been more impressive on the wall of my family room. The 24" was a bit small but the size was the only thing small about it. The clock really is impressive. I was concerned that I could not get the floating inter dial in the right position, but the installation sheet with the exact screw placement guide was fantastic! It looks great! Also, it looks heavy even though it is not! Great clock - great service! Thank you! I RECEIVED THE CLOCK TODAY AND IS VERY MUCH PLEASED WITH THE PRODUCT,A VERY GOOD QUALITY AND CAN RECOMMEND ANY ONE WHO WANTS TO PURCHASE. THIS IS AN ANNEVERSARY PRESENT FOR US AND I AM SURE WE WILL ENJOY IT FOR MANY YEARS TO COME. THANK YOU FOR YOUR PROMPT SERVICE. We received our new clock yesterday. I just wanted to say thank you for your help. I will certainly recommend to my friends. Your customer service is excellent. I would like to thank you for keeping me and my mom informed. She received her clock today as promised and was very pleased. I am glad I found you on Google. I just wanted to let you know that our Howard Miller wall clock arrived this morning via overnight UPS and it is beautiful! Thank you so much for your help in getting this clock here so fast in time for our office Christmas party! Whoever helped me yesterday on the telephone from Clockway could not have been nicer. We really appreciate it! I wanted to thank you for your amazing service. I ordered a clock from you on Monday, January 7th and it was delivered to my door Thursday, January 10th! It was carefully packaged and in perfect condition. I wish I had found you before the holidays. I had ordered a clock from one of the large department stores. They promised delivery and then put the item on backorder without notifying me. Ended up giving my daughter a picture and an IOU for a Christmas gift. She loves the clock I purchased from you! Thank you for this wall clock. It is an impressive piece and am enjoying watching it work. We have put it in a case that was made for another clock that had been stolen from us and it fits extremely well. It was good to have the exact diemsnion of the timepiece and it fit perfectly, just have to draw the weights a bit more often. Thank you for you service and if I have any other needs for time pieces, we will come to you. I had ordered this clock for my husband for Christmas, BUT when it arrived and I saw how magnificent it was I gave it to him early. He actually cried when he saw it. He was so happy. The service was fast and it arrived sooner than I ever expected. I will definitely order again. Thanks so much for your prompt and courteous service. I am totally impressed with the way you handled my problem. The new clock is absolutely beautiful, and you could not have been easier to deal with. I can certainly recommend your company to everyone. I would definitely order from you again. Just wanted to let you know that the 'Melody and Motion' clock I ordered arrived in perfect condition and when it was unwrapped Christmas Day, my wife absolutely loved it!!!!! I have since found other places that sell similar items but none match you folks!!! I have added your store to my list of favorite places. I want you to know that I could not believe how very quickly you processed and shipped the clock I ordered! It will not be taken out of the box until Christmas, since I purchased it for my daughter, but it was packed unbelievably well, so I don't forsee any problems. Thank you very much. Thanks for the great service & product. You will be hearing from me again. The free shipping was fantastic. Keep up the good work. The clock I ordered on 11/16 arrived today ... in just 4 business days! I am so pleased. It is in perfect condition and is just as beautiful as pictured on your website. The enthusiastic testimonials on your website were not exaggerating in the least. Thank you for offering quality merchandise at such reasonable prices ... not to mention free shipping ... and prompt service, too! Unbelievable!! Best prices on the web, so I called and ordered three clocks and they were delivered the very next day...and for free! Great value and great service. We will definitely use your company again. Just wanted to let you people know how great your service is! Ordered yesterday, was here today! And for the record, Ive shopped with you before, and will continue to do so! I received my new cuckoo clock yesterday and just can't tell you how satisfied I am with your company. It was shipped very fast and packaged extremely well. It is the first cuckoo clock We have ever owned and was also an anniversary present for my Wife. I wanted to thank all of you for making Our anniversary a very special one. I hope to do more business with your company in the further. I received the Seth Thomas Brentwood wall clock from you this week. I want to compliment you on the extremely careful packaging the clock arrived in. When ordering, this was my only concern, since at times UPS has delivered items that were in bad shape due to rough handling and/or inadequete packaging. You far surpassed my expectations. The clock is beautiful on the wall and will probably become a family heirloom in the future. I would reccomend you to anyone looking for a great product at a fair price, and also meticulously packaged and shipped. This was my first time shopping online and I want to say yall made a great impression for me. Every question I had was answered in the same day and answered in detail. I appreciate the time you put in to help me. This company has great service. Whenever I need a clock yall will be my first option. THANK YOU. By BLAKE. I already received my clock. It is absolutely beautiful!!!! I love it. Your Web sight is great and I will be buying another clock real soon. Thank you so much for a "speedy" delivery, couldn't believe how soon i got the clock after ordering it! It is absolutly awesome, my nephew is going to love it, and can't wait to send it to him for Christmas. He'll be getting his present "on time"!! Thanks again, and won't forget your store!!!! Diane H.
I Received my item today , I just wanted to say, thank you for providing excellent service for me. The product you sold is exceptional, I really adore it and it's a pleasure to do business with you. I love the prices and I am always looking forward to shop again in the near future!...Thank you and have a wonderful holiday! ...Thanks again for great customer service. I commend you for your service after the sale. I am glad I ordered this clock from such a reputable company. Thanks for you great service and communication! Just wanted to let you know that we received our clock and we love it! Your company has provided quick service and we would not hesitate to recommend you to any of our acquaintances. The clock is even better looking than what i saw online & I know my friend is going to enjoy it. Looking forward to purchasing from you in the future. Have a Merry Christmas & a Happy New Year. My wife ordered a Howard Miller Grandfather's clock from you. We just received it the other day. It was in perfect condition. We both are quite pleased at the service and attention we received. It was a pleasant experience. Hi! Yesterday we received the clock we ordered, and wanted you to know we couldn't be more pleased!! We wanted a really nice clock as a gift for our mother, and were a little hesitant to order online from a company with which we were unfamiliar. But you guys were great! First, we compared other dealers, and you were the most reasonably-priced. Then add free shipping and it was a huge savings! Being able to order online was a nice convenience, and we received an email confirmation immediately after placing the order. A couple days later I called your company to check on the status of shipping --the person on the other end of the phone was very friendly and accommodating. The clock arrived in perfect condition, but it was definitely a plus to know that your company guarantees replacement if there had been anything wrong. I WILL be telling my friends about your quality company! The clock arrived on Friday and in perfect condition. Thank you so much for all your effort and help - I have been singing your praises to everyone. I was very nervous buying the clock on the internet but you have made it a very rewarding experience. By the way, my partner was stunned and just loves the clock - thanks for helping me give him a very happy 60th birthday. Thank you very much for everything, the clock will be arriving on friday. I can't thank you enough for such great service, the clock will be joining the other in the living room, I will be in touch again to order. Just wanted to let you know that I received my shipment yesterday (11-17). The item arrived in excellent condition and the clock that I ordered was just as pictured on your website. Thank you so much for your quick and efficient service. I ordered the Cuckoo Clock on Saturday, September 24th and received the clock from UPS on the 27th. Unbelievably great service! Thank you and the clock is exactly as advertised! I want to thank you for my recent order. I absolutely love my new clip watch. I have been receiving so many compliments! I will recomend your company to all my friends and family. You guys are the best and have reasonable prices. Thanks again! Hi Folks, I just want to Thank you for that helpful info you gave me. I look faward to shopping with you again someday! Just want to let you know that I have received my clock and want to thank you very much for your service. Just a note to tell you that we received our black forest cuckoo clock without any damage and in fine working condition. We are very happy with your services and shall contact you again for merchandise. Hello folks, I just received my beautiful clock and it's much better than I ever thought it would be. It's perfect for the spot in my living room where I had pictured it. Your service was very fast and the packaging was wonderful. I just wanted to say thank you so very much for my beautiful clock. I just wanted to let you know I received my mantel clock; it was in perfect condition, just like the picture. It works perfect, and is beautiful on our mantel. I will highly recommend your company to whom ever ask, where I bought it. Thank you. Your company has been very nice and always so responsive. We order a lot of items on-line and no one has been as "user friendly" as your group. I just wanted to let you know that I received my clocks last week and am absolutely thrilled with them. I will be recommending you to my friends. Just got it today - man, that was quick - thanks so much. Thanks a ton, literally - the wife knew basically what it was and asked "Do I have to wait until Christmas ??? huh huh pretty please? Ohhhh ok - it is magnificient - the artwork and sound is just awsome - hope you folks have a super holiday season. Our Cuckoo Clock came today. I wanted to drop you a note and let you know it is absolutely beautiful. We were expecting high quality and you exceeded our expectations! It is truly a delight! Beautiful Absolutely Gorgeous. What a thrill to see this in person!! I can't believe how fast it arrived. I ordered it on the evening of 12/18 and it was here the morning of 12/22. I am having a hard time keeping it till Christmas, I want to give it now and see their eyes pop when they open it. Review: the clock I ordered looks exactly as it is on the picture for a great price. Fast free shipping!can't beat that. 30% Off & Free Gifts! Up To 30% Off & Free Gifts! Up to 30% Off + Free Shipping! 25% Off & Free Gifts! Unbelievable!! Best prices on the web, so I called and ordered three clocks and they were delivered the very next day...and for free! Great value and great service. We will definitely use your company again! All Online Order Will be Processed Same Day or Next Business Day! We are the authorized dealer for all products we sell.